France’s President Francois Hollande has come under fire for reportedly using state money for transportation and other needs of his actress lover, Julie Gayet, according to the French media. On Friday, the ‘Closer’ weekly magazine published photos of Gayet going to the city of Nantes to the set of the film she’s producing in a “state-owned car”. In the picture, Gayet was also accompanied by one of the French president’s bodyguards. "Julie Gayet may not ever have officially appeared on the arm of the president, but it seems she benefits from other privileges linked to her personal relationship with the head of state, as evidenced by her security worthy of a first lady," the magazine wrote. Hollande’s representatives refused to comment on the matter, The Local reported. However, the main opposition party UMP slammed the latest news. "But if that's not the case, there is no reason that public funds should be used to accompany, transport and protect Ms Gayet," he added. The French government, nevertheless, seems to be taking a compromise approach: Finance Minister Michel Sapin said potential "threats" could justify these measures. "When one is in the public [eye], and comments are made on your personal situation, there can be threats," he told iTele TV channel. He couldn’t specify if Gayet was receiving threats or not, though. The affair has been in the spotlight of the French media for some time: in November, celebrity magazine Voici published pictures of Hollande and Gayet inside the Elysée presidential residence, and it caused five employees there to be reassigned, as this constituted a major security breach. 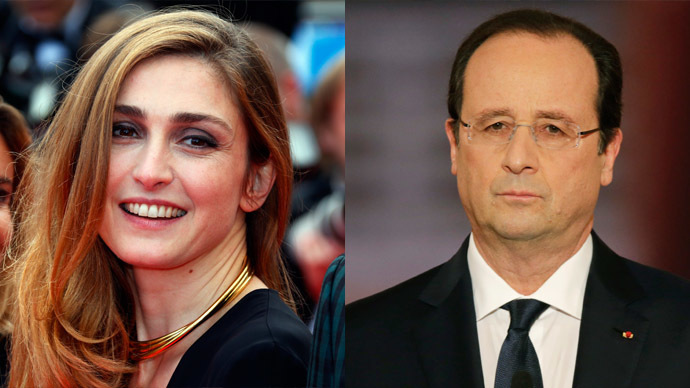 Hollande’s connection to Gayet dates back to at least 2012, when she campaigned for him ahead of the presidential election. The actress was in one of the campaign videos in which she described Hollande as a "humble", "fantastic" man "who is really tuned in."